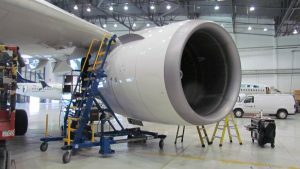 Our wide range of Aircraft Maintenance Access Stands/Tooling includes the Aircraft Maintenance Stand, Landing Gear Access Stand, Aviation Platform Stand, Engine Access Stand and Tire Trailer among others. The all-new Engine Access Stand has been designed to access the top of the engine under the cowl. 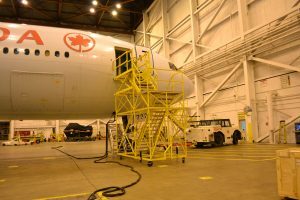 In use at Air Canada, American Airlines, Delta Airlines and Boeing on both Rolls Royce and GE engines the Engine Access Stand provides a safe working solution to a difficult area on the aircraft to reach. Tested and operational on most wide and narrow body aircrafts the Engine Access Stand is often used to access other difficult areas such as above the wing. The Aircraft Maintenance Stand is designed to allow for safe access to the nose cowls, fan cowls and pylon disconnect zones on PW, GE and RR engines, thus providing a safe working solutions to many of the traditionally difficult under-cowling maintenance locations. The Aviation Platform Stand has a 660-pound capacity and provides a safe platform for 1 or 2 technicians to maintain access to a variety of different aircrafts. This design has been tested on and is currently being used by: The B757, Airbus and Boeing Wide Body Aircrafts. 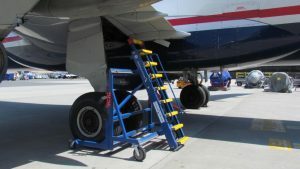 The Landing Gear Access Stand provides safe access to all maintenance locations of the main and nose main landing gear. The base frame is designed to adjust to most wheel assembly configurations on main and nose gear. 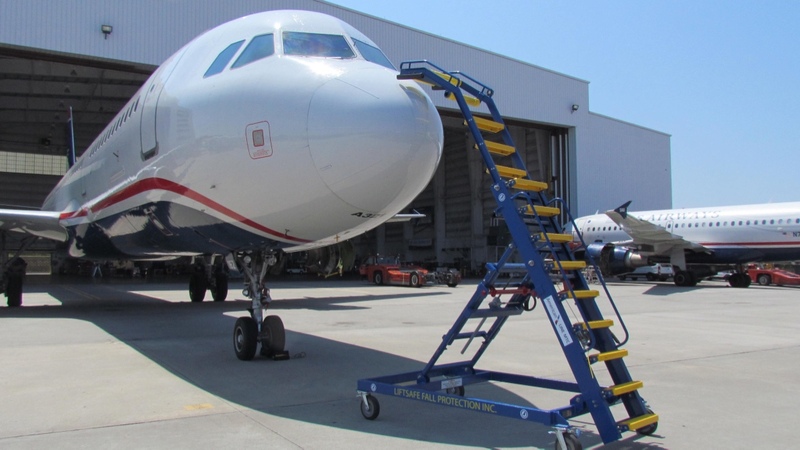 Our Aviation Maintenance Stands are used worldwide and provide safe working platforms for routine maintenance, designed to service the aviation and aerospace community. 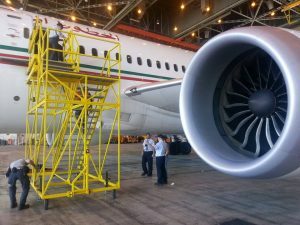 Our Access Stands and Platforms have been tested and are operational on a multitude of aircraft including: B737-B787 Series, A320 Family, Airbus, A330-A380 Series, EMB175-190, among others. We also have an extensive line of Fall Protection Systems utilized by several airports/hangars which include: Fall Protection Netting, Guardrail Systems, Overhead Cranes, Facility Inspection Services, Vacuum Fall Protection Systems, Overhead Fall Protection Systems, and custom Aviation Services. Our dedicated team of industry specialists are available anytime to assist with your operation’s safety and maintenance challenges. The evolution of the Engine Access Stand has resulted in an improved design. Functionality improvements include outboard engines and pylon access (A380, A340 and B747-8) as well as avionics and aft- fuselage access points. The DF071554-06S is available without the integrated scissor base as seen in our all-new Aircraft Maintenance Stands 6X (AMS-6X) Model. In use at multiple operators and aircraft manufacturers alike, the unit has flexibility for use on all Boeing wide body aircraft as well as the B757. The design also allows for full use on Airbus wide body aircraft as well as the A320 family. The unit is also designed to safely access the same points outside of the cowling, specifically forward and aft pylon service points, as well as hard to reach refuel panels. The hydraulic pitch and height adjustment allow for the diverse angle and height variables frequently encountered when servicing many areas on aircraft. The Stand contains extensive use of aluminum construction for easy movement and corrosion- resistant powder coat finish for longevity. The Engine Access Stand contains a variety of safety features for maintenance workers as well as for the aircraft itself. ATACS bumper pads as well as Rubber D bumper pads on the aircraft interface surfaces protect the aircraft while in use. The Stand contains anti-fatigue and anti-slip ladder rungs as well as fail-safe hydraulic cylinder locks for height and pitch, ensuring worker safety during use. All castors contain both brake and swivel locks. The Engine Access Stand has several fall-restraint anchor points on the upper ladder. For increased safety and ease of mobility, the stand comes standard equipped with 4 corner levelling jacks, fold away tow bars and lift truck fork pockets. Optional accessories are Access Stand Harness and Lanyards. The stand is designed and tested in accordance with ANSI-ASC A14.7 and BS EN 131.7 including CE Certification. 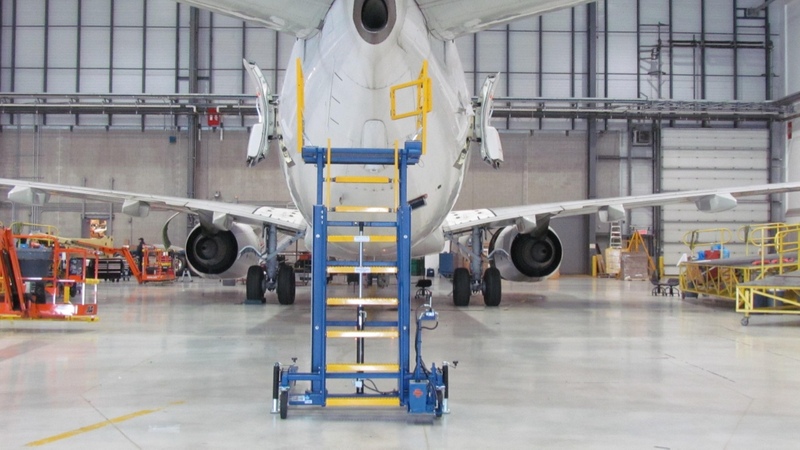 The Aircraft Maintenance Stand comes standard with an integrated scissor based which helps facilitate access on traditionally difficult to reach areas of the aircraft. On top of this the hydraulic pitch and height adjustment allow for the diverse angle and height variables frequently encountered when servicing many areas on aircraft. The Stand contains extensive use of aluminium construction for easy movement and corrosion-resistant powder coat finish for longevity. 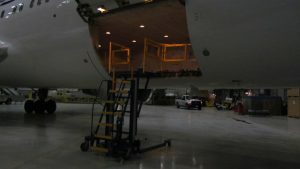 In addition the Aircraft Maintenance Stand has a variety of different safety features designed to keep both maintenance workers and the aircraft itself safe. Some of these safety features include ATACS bumper pads as well as Rubber D bumper pads on the aircraft interface surfaces protect the aircraft while in use. The Stand contains anti-fatigue and anti-slip ladder rungs as well as failsafe hydraulic cylinder locks for height and pitch, ensuring worker safety during use. All castors contain both brake and swivel locks. The Aircraft Maintenance Stand has several fall-resistant anchor points on the upper ladder. The Aviation Platform Stand has a 660-pound capacity and provides a safe platform for 1 or 2 technicians to maintain access to a variety of different aircrafts. This design has been tested on and is currently being used by: The B757, Airbus and Boeing Wide Body Aircrafts. 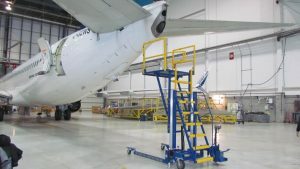 The lowered position of this stand clears wheel doors and can be used when servicing standard and wide platform configurations by a multitude of operators, MRO’s and manufacturers. To ensure corrosion resistance and maintain longevity the stand comes in a powder coat finish. The Aviation Platform Stand is hydraulically actuated via an ergonomically positioned foot pump and has collapsible guardrails. 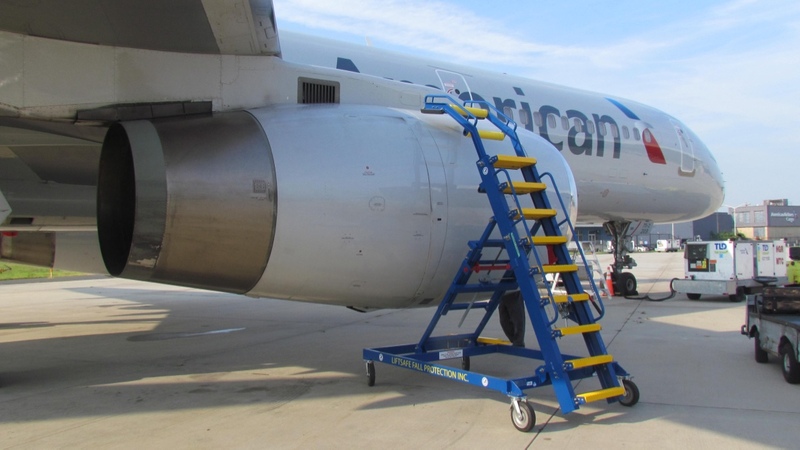 Anti-slip ladder rungs ensure the safety of your maintenance staff and Rubber D bumpers protect the aircraft. All castors contain brakes and swivel locks. 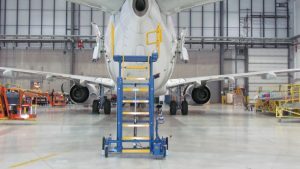 Some optional accessories for the Aviation Platform Stand that ensure safety compliance include: a removable tow bar and telescopic safety rails. Our Professional Engineers can design custom models and we will work with you to determine your specific requirements. 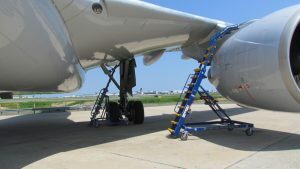 The Landing Gear Access Stand provides safe access to all maintenance locations of the main and nose main landing gear. The base frame is designed to adjust to most wheel assembly configurations on main and nose gear. The hydraulic height adjustment, one hand lateral operation and full swivel and lock casters allow single technician placement and use. The ATACS bumper pads at the top of the stand as well as the Rubber D bumper pads on the landing gear side ensure the aircraft interface is protected. Ensuring aircraft and technician safety was paramount with the design of this stand. The Main Landing Gear Access Stand utilizes anti-fatigue and anti-slip ladder rungs and fall resistant anchorage on the upper ladder. A corrosion resistant powder coat finish ensures the longevity of the stand. A rigid tow bar for long distance towing can be included in the design. The Landing Gear Access Stand was designed and is tested on all Boeing wide body aircraft, as well as the B757 both in the main and nose gear positions. The unit has proven effective on aft fuselage access of the B737. Optional accessories for this unit are: a bolt on tow bar, lift truck fork pockets and rear leveling jacks. Effectivity also includes the Airbus wide body group of products, the main gear and several other access points of the A320 family and aft fuselage points of the Embraer 175 & 190. 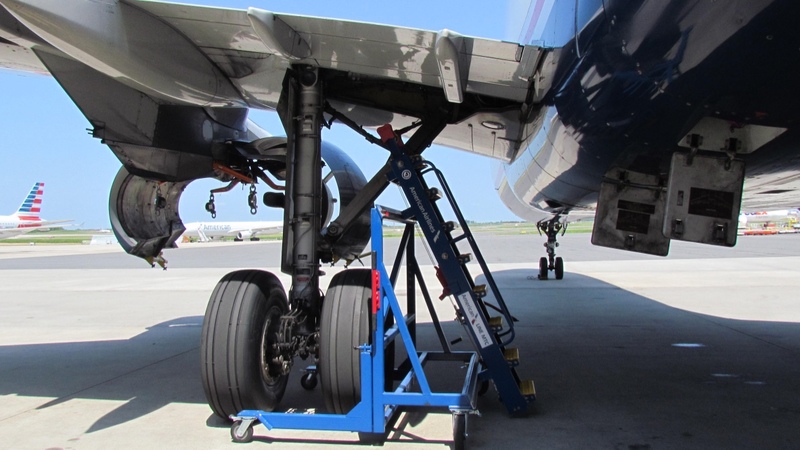 The Landing Gear Access Stand, although designed for specific landing gear access tasks, has proven itself in many other maintenance inspection and technical operations scenarios. 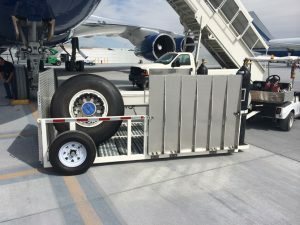 The Aviation Tire Trailer was created with the safe and quick transportation of aircraft ties, brakes and required tooling in mind, while meeting the storage requirements of regulatory bodies, (EASA, TC, FAA). This allows for it to be operational on both a commercial and private/business jet operators. With the option of it being configured for Nitrogen and/or Oxygen servicing it can also be configured to carry 2 B777 tires along with the required tire change jacks and tools or a full ship set of tires for a CL-605. 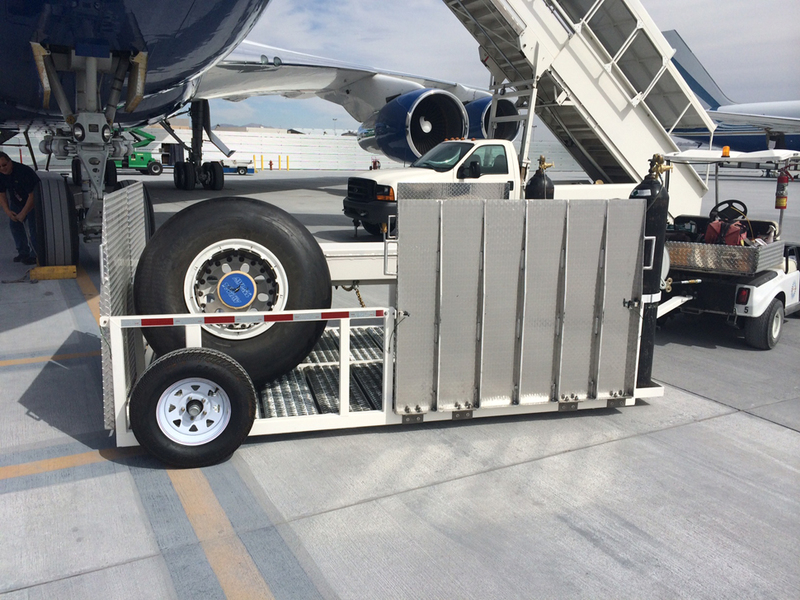 Liftsafe Fall Protection has designed many different sizes of both standard and custom tire trailers all based around the operational needs of the aircraft. With a low profile design and lightweight build these aviation tire trailers will help to ensure the safety of your maintenance staff when it is in use. Our professional engineers will work with you in order to ensure you have an Aviation Tire Trailer that will work best for your fleet of aircraft, which is designed and tested to meat ANSI-ASC A15.7 and BS EN 131.7 including CE Certification.